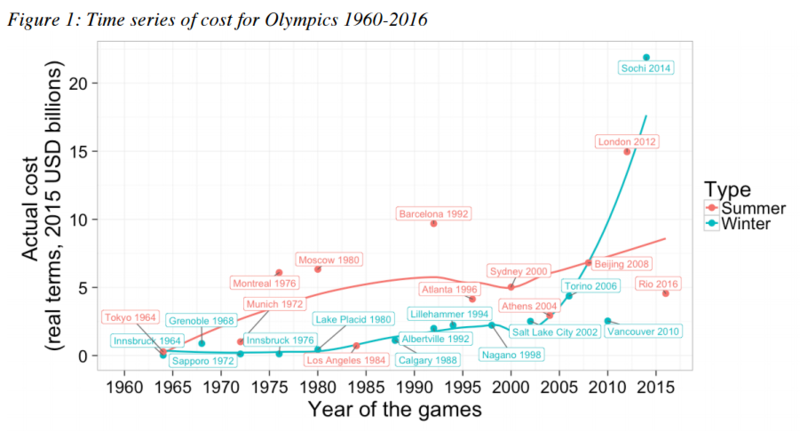 Hosting the Olympics is a costly business – and the final price can escalate quickly – according to a new study . A Summer Olympic Games now costs an average of $5.2bn (at 2015 levels), while the average Winter Olympics costs $3.1bn, a working paper from The University of Oxford and Said Business School found. And these figures only include sports-related costs. Moreover, no Games since 1960 has come in under budget. In fact, nearly half have cost overruns of more than 100%. Montreal 1976 had a cost overrun of 720%, Barcelona 1992 of 266% and Lake Placid 1980 of 324%. This chart indicates the apparent rise in the cost of hosting the Games between 1964 and 2016. Although the chart only includes sports-related costs, and not those associated with urban and transport infrastructure, the most expensive Games stand out. For the Summer Olympics, in red, the most expensive is London 2012 at $15bn – nearly $10bn above average. London also sits far above second-placed Barcelona 1992 at $9.7bn. However, the title of the most expensive Olympics of all time goes to the Sochi 2014 Winter Olympics - $21.9bn. At the other end of the scale, the Tokyo Summer Olympics of 1964 cost just $282m, while the Innsbruck Winter Olympics of the same year cost just $22m. Not only are they expensive, but Olympic Games don’t stay on budget. 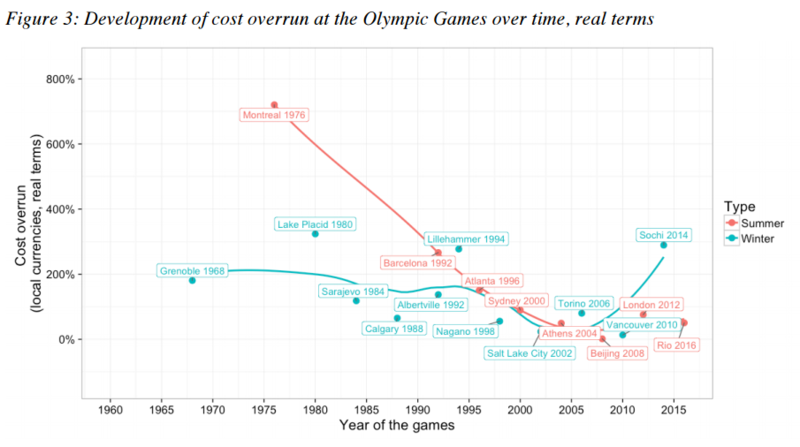 Between Grenoble 1968 and Nagano 1998, the sports-related cost overrun averaged 230%. Since the new millennium, this has fallen to 75% - hitting a low of just 2% at Beijing 2008. However, recent Games in London and Sochi have reversed this trend. London’s costs overran by 76%, while Sochi’s by an enormous 289%. Since the mid-1990s the Olympic Games Knowledge Management Program has worked to help new host cities learn from previous ones. The program is designed to increase efficiency through shared knowledge. The report uses the latest projected cost for Rio, from January 2016. The preliminary cost is $4.6bn, with an overrun of 51% in real terms. The authors highlight that “the Rio Games appear to be on track to reverse the high expenditures of London 2012 and Sochi 2014.” Its projected cost is similar to the median for other Summer Olympics.